Create a super-cute digital scrapbook filled with photos and drawings that YOU create! Click the stylus to remotely snap a photo to add to your scrapbook page! Shake the stylus to trigger special animations and sounds! 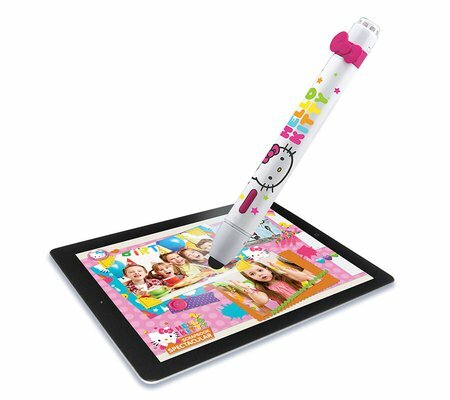 Flip the stylus to cause fun and goofy visual effects. Create - Design a custom scrapbook with Hello Kitty and her friends. Build pages filled with awesome drawings tools, stickers and wacky tools like bubble splatters and beads to make each page unique! Add Pictures and Sounds - Users' can also take an in-app photo, add a cool filter and then overlay Hello Kitty-inspired captions, stickers and doodles to create amazing custom pages. Users can even use the voice recorder to narrate each page! Share Your Scrapbook Page - When you are done, save page to your very own digital scrapbook. Flip through the pages individually or share them with friends as a slideshow. Awesome!